A spaceplane is an aerospace vehicle that operates as an aircraft in Earth's atmosphere, as well as a spacecraft when it is in space. It combines features of an aircraft and a spacecraft, which can be thought of as an aircraft that can endure and maneuver in the vacuum of space or likewise a spacecraft that can fly like an airplane. Typically, it takes the form of a spacecraft equipped with wings, although lifting bodies have been designed and tested as well. The propulsion to reach space may be purely rocket based or may use the assistance of airbreathing jet engines. The spaceflight is then followed by an unpowered glide return to landing. Six kinds of spaceplanes have successfully flown to date, having reentered Earth's atmosphere, returned to Earth, and safely landed — the North American X-15, Space Shuttle, Buran, Boeing X-37, and Scaled Composites' SpaceShipOne and SpaceShipTwo. All six are considered rocket gliders. As of 2019[update], only these aircraft and conventional rockets have succeeded in reaching space. Three of these six (X-15, SpaceShipOne, and SpaceShipTwo) are rocket-powered aircraft, having been carried up to an altitude of several tens of thousands of feet by an atmospheric mother ship before being released, and then flying beyond the Kármán line (with the exception of SpaceShipTwo), the internationally-accepted boundary of Earth's atmosphere, under their own power. Three (Space Shuttle, Buran, and X-37) are vertical takeoff horizontal landing (VTHL) vehicles relying upon rocket lift for the ascent phase in reaching space and atmospheric lift for reentry, descent and landing. The three VTHL spaceplanes flew much further than the aircraft launched ones, not merely leaving Earth's atmosphere but also entering orbit around it, which requires at least 50 times more energy on the way up and heavy heat shielding for the trip back. Of the six vehicles, four have been piloted by astronauts, with the Buran and X-37 flying unmanned missions. Landing of NASA's Space Shuttle Atlantis. The American Space Shuttle orbiters were manned orbital spaceplanes. Significant features distinguish spaceplanes from traditional spacecraft. All aircraft utilize aerodynamic surfaces in order to generate lift. For spaceplanes a variety of wing shapes can be used. Delta wings are common, but straight wings, lifting bodies and even rotorcraft have been proposed. Typically the force of lift generated by these surfaces is many times that of the drag that they induce. Because suborbital spaceplanes are designed for trajectories that do not reach orbital speed, they do not need the kinds of thermal protection orbital spacecraft required during the hypersonic phase of atmospheric reentry. The Space Shuttle thermal protection system, for example, protects the orbiter from surface temperatures that could otherwise reach as high as 1,650 °C (3,000 °F), well above the melting point of steel. A spaceplane operates as an aircraft in Earth's atmosphere. Aircraft may land on firm runways, helicopter landing pads, or even water (amphibious aircraft), snow or ice. To land, the airspeed and the rate of descent are reduced such that the aircraft descends at a slow enough rate to allow for a gentle touch down. Landing is accomplished by slowing down and descending. This speed reduction is accomplished by reducing thrust and/or inducing a greater amount of drag using flaps, landing gear or speed brakes. Splashdown is an easier technical feat to accomplish, requiring only the deployment of a parachute (or parachutes), rather than successfully aviating the atmosphere. Project Gemini's original concept design was as a spaceplane, with paraglider and wheels (or skis) attached. However, this concept was abandoned in favor of parachute splashdowns, because of expensive technical failures during testing and development. Whereas Project Gemini's splashdown parachutes took only 5 months to develop in 1963, Gemini's spaceplane concept failed to materialize even after nearly 3 years of continued development. All spaceplanes to date have used rocket engines with chemical fuels. As the orbital insertion burn has to be done in space, orbital spaceplanes require rocket engines for at least that portion of the flight. A difference between rocket based and air-breathing aerospace plane launch systems is that aerospace plane designs typically include minimal oxidizer storage for propulsion. Air-breathing aerospace plane designs include engine inlets so they can use atmospheric oxygen for combustion. Since the mass of the oxidizer is, at takeoff, the single largest mass of most rocket designs (the Space Shuttle's liquid oxygen tank weighs 629,340 kg, more than one of its solid rocket boosters), this provides a huge potential weight savings benefit. However, air breathing engines are usually very much heavier than rocket engines and the empty weight of the oxidizer tank, and since, unlike oxidizer, this extra weight (which is not expended to add kinetic energy to the vessel, as is propellant mass) must be carried into space it may offset the overall system performance. Types of air breathing engines proposed for spaceplanes include scramjet, liquid air cycle engines, precooled jet engines, pulse detonation engine and ramjets. Some engine designs combine several types of engines features into a combined cycle. For instance, the Rocket-based combined cycle (RBCC) engine uses a rocket engine inside a ramscoop so that at low speed, the rockets thrust is boosted by ejector augmented thrust. It then transitions to ramjet propulsion at near-supersonic speeds, then to supersonic combustion or scramjet propulsion, above Mach 6, then back to pure rocket propulsion above Mach 10. The flight trajectory required of air-breathing aerospace vehicles to reach orbit is to fly what is known as a 'depressed trajectory' which places the aerospace plane in the high-altitude hypersonic flight regime of the atmosphere. This environment induces high dynamic pressure, high temperature, and high heat flow loads particularly upon the leading edge surfaces of the aerospace plane. These loads typically require special advanced materials, active cooling, or both, for the structures to survive the environment. Rocket-powered spaceplanes also face a significant thermal environment if they are burning for orbit, but this is nevertheless far less severe than air-breathing spaceplanes. Suborbital space planes designed to briefly reach space do not require significant thermal protection, as they experience peak heating for only a short time during re-entry. Intercontinental suborbital trajectories require much higher speeds and thermal protection more similar to orbital spacecraft reentry. A wingless launch vehicle has lower aerodynamic forces affecting the vehicle, and attitude control can be active perhaps with some fins to aid stability. For a winged vehicle the centre of lift moves during the atmospheric flight as well as the centre of mass; and the vehicle spends longer in the atmosphere as well. Historically, the X-33 and HOTOL spaceplanes were rear engined and had relatively heavy engines. This puts a heavy mass at the rear of the aircraft with wings that had to hold up the vehicle. As the wet mass reduces, the centre of mass tends to move rearward behind the centre of lift, which tends to be around the centre of the wings. This can cause severe instability that is usually solved by extra fins which add weight and decrease performance. World's first spaceplanes: North American X-15, Space Shuttle, Buran, SpaceShipOne, Boeing X-37. 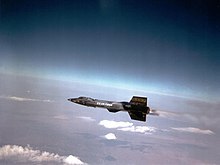 The X-15 reached space in 1962/1963 (USAF/FAI Kármán line classifications). SpaceShipOne was piloted by the first commercial astronaut. Both X-15 and SpaceShipOne ascend horizontally from a mother ship. Both Buran and X-37 spaceflights were unmanned. The X-37 launches atop an Atlas V 501 launch vehicle. All three of the orbital spaceplanes successfully flown to date utilize a VTHL (vertical takeoff, horizontal landing) design. They include the piloted United States Space Shuttle and two unmanned spaceplanes: the late-1980s Soviet Buran and the early-2010s Boeing X-37. The early-1980s BOR-4 (subscale test vehicle for the Spiral spaceplane that was subsequently cancelled) was a spacecraft that did successfully reenter the atmosphere and fly like an aircraft. But it was not designed to sustain atmospheric flight. It was designed to stop flying, open a parachute and then splash in the ocean. These vehicles have used wings to provide aerobraking to return from orbit and to provide lift, allowing them to land on a runway like conventional aircraft. These vehicles are still designed to ascend to orbit vertically under rocket power like conventional expendable launch vehicles. One drawback of spaceplanes is that they have a significantly smaller payload fraction than a ballistic design with the same takeoff weight. This is in part due to the weight of the wings — around 9–12% of the weight of the atmospheric flight weight of the vehicle. This significantly reduces the payload size, but the reusability is intended to offset this disadvantage. While all spaceplanes have used atmospheric lift for the reentry phase, none to date have succeeded in a design that relies on aerodynamic lift for the ascent phase in reaching space (excluding a mother ship first stage). Efforts such as the Silbervogel and X-30/X-33 have all failed to materialize into a vehicle capable of successfully reaching space. The Pegasus winged booster has had many successful flights to deploy orbital payloads, but since its aerodynamic vehicle component operates only as a booster, and not operate in space as a spacecraft, it is not typically considered to be a spaceplane. On the other hand, OREX is a test vehicle of HOPE-X and launched into 450 km LEO using H-II in 1994. OREX succeeded to reenter, but it was only hemispherical head of HOPE-X, that is, not plane-shaped. Other spaceplane designs are suborbital, requiring far less energy for propulsion, and can use the vehicle's wings to provide lift for the ascent to space in addition to the rocket. As of 2018, three such crafts flew successfully to and from space, back to Earth, namely the North American X-15 and Virgin Galactic SpaceShipOne and SpaceShipTwo. All these crafts were not capable of entering orbit and all of them began their independent flight only after being lifted to high altitude by a carrier aircraft. HYFLEX was a miniaturized suborbital demonstrator of HOPE-X launched in 1996. HYFLEX flew to 110 km altitude and succeeded in atmospheric reentry, subsequently achieving hypersonic flight. Though HYFLEX achieved a controlled aircraft descent, it was not designed for a planned aircraft landing, the engineers opting instead for a splashdown without a parachute. Recovery of the HYFLEX failed and it sank in the Pacific Ocean. United States Gemini tested the use of a Rogallo wing rather than a parachute. August 1964. Various types of spaceplanes have been suggested since the early twentieth century. Notable early designs include Friedrich Zander's spaceplane equipped with wings made of combustible alloys that it would burn during its ascent, and Eugen Sänger's Silbervogel bomber design. Also in Germany and then in the US, winged versions of the V-2 rocket were considered during and after World War II, and when public interest in space exploration was high in the 1950s and '60s, winged rocket designs by Wernher von Braun and Willy Ley served to inspire science fiction artists and filmmakers. The U.S. Air Force invested some effort in a paper study of a variety of spaceplane projects under their Aerospaceplane efforts of the late 1950s, but later ended these when they decided to use a modified version of Sänger's design. The result, Boeing X-20 Dyna-Soar, was to have been the first orbital spaceplane, but was canceled in the early 1960s in lieu of NASA's Project Gemini and the U.S. Air Force's Manned Orbiting Laboratory program. In 1961, NASA originally planned to have the Gemini spacecraft land on a firm, solid ground runway with a Rogallo wing airfoil, rather than as a splashdown with parachute. The test vehicle became known as the Paraglider Research Vehicle. Development work on both Gemini's splashdown parachute and spaceplane paraglider began in 1963. By December 1963, the parachute was already to undergo full-scale deployment testing. On the other hand, by December 1963 the paraglider spaceplane concept was running into technical difficulties and subsequently became replaced by the parachute splashdown concept. Though attempts to revive Gemini's paraglider spaceplane concept persisted within NASA and North American Aviation as late as 1964, NASA Headquarters Gemini Chief William Schneider discontinued development as technical hurdles became too expensive. The Rockwell X-30 National Aero-Space Plane (NASP), begun in the 1980s, was an attempt to build a scramjet vehicle capable of operating like an aircraft and achieving orbit like the shuttle. President Ronald Reagan described NASP in his 1986 State of the Union address as "...a new Orient Express that could, by the end of the next decade, take off from Dulles Airport and accelerate up to twenty-five times the speed of sound, attaining low Earth orbit or flying to Tokyo within two hours..." There were six identifiable technologies which were considered critical to the success of the NASP project. Three of these "enabling" technologies were related to the propulsion system, which would consist of a hydrogen-fueled scramjet. The NASP program became the Hypersonic Systems Technology Program (HySTP) in late 1994. HySTP was designed to transfer the accomplishments made in hypersonic technologies by the National Aero-Space Plane (NASP) program into a technology development program. On 27 January 1995 the Air Force terminated participation in (HySTP). It was canceled due to increasing technical challenges, and growing budgets. In 1994 Mitchell Burnside Clapp proposed a single stage to orbit peroxide/kerosene spaceplane called "Black Horse". It was to take off almost empty and undergo mid-air refueling before launching to orbit. The Lockheed Martin X-33 was a 1/3 scale prototype made as part of an attempt by NASA to build a SSTO hydrogen-fuelled spaceplane VentureStar that failed when the hydrogen tank design proved to be unconstructable in the planned way. The edition of 5 March 2006 of Aviation Week & Space Technology published a story purporting to be "outing" a highly classified U.S. military two-stage-to-orbit spaceplane system with the code name Blackstar, SR-3/XOV among other nicknames. In 1999 NASA started the Boeing X-37 project, an unmanned, remote controlled spaceplane. The project was transferred to the U.S. Department of Defense in 2004. Boeing has proposed that a larger variant of the X-37B, the X-37C could be built to carry up to six passengers up to LEO. 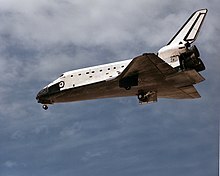 The spaceplane would also be usable for carrying cargo, with both upmass and downmass (return to Earth) cargo capacity. The ideal size for the proposed derivative "is approximately 165 to 180 percent of the current X-37B." The Soviet Union firstly considered a preliminary design of rocket-launch small spaceplane Lapotok in early 1960s. Then the Spiral airspace system with small orbital spaceplane and rocket as second stage was widely developed in the 1960s–1980s. Mikoyan-Gurevich MiG-105 was a manned test vehicle to explore low-speed handling and landing. In recent times[when? ], an orbital spaceplane, called cosmoplane (Russian: космоплан) capable of transporting passengers has been proposed by Russia's Institute of Applied Mechanics. According to researchers, it could take about 20 minutes to fly from Moscow to Paris, using hydrogen and oxygen-fueled engines. 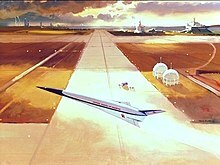 The Multi-Unit Space Transport And Recovery Device (MUSTARD) was a concept explored by the British Aircraft Corporation (BAC) around 1968 for launching payloads weighing as much as 2,300 kg (5,000 lb) into orbit. It was never constructed. The British Government also began development of a SSTO-spaceplane, called HOTOL, but the project was canceled due to technical and financial issues. The lead engineer from the HOTOL project has since set up a private company dedicated to creating a similar plane called Skylon with a different combined cycle rocket/turbine precooled jet engine called SABRE. This vehicle is intended to be capable of a single stage to orbit launch carrying a 15,000 kg (33,000 lb) payload into low Earth orbit. If successful it would be far in advance of anything currently in operation. The British company Bristol Spaceplanes has undertaken design and prototyping of three potential spaceplanes since its founding by David Ashford in 1991. The European Space Agency has endorsed these designs on several occasions. France worked on the Hermes manned spaceplane launched by Ariane rocket in the late 20th century, and proposed in January 1985 to go through with Hermes development under the auspices of the ESA. Hopper was one of several proposals for a European reusable launch vehicle (RLV) planned to cheaply ferry satellites into orbit by 2015. One of those was 'Phoenix', a German project which is a one-seventh scale model of the Hopper concept vehicle. The suborbital Hopper was a FESTIP (Future European Space Transportation Investigations Programme) system study design A test project, the Intermediate eXperimental Vehicle (IXV), has demonstrated lifting reentry technologies and will be extended under the PRIDE programme. The FAST20XX Future High-Altitude High Speed Transport 20XX aims to establish sound technological foundations for the introduction of advanced concepts in suborbital high-speed transportation with air-launch-to-orbit ALPHA vehicle. HOPE was a Japanese experimental spaceplane project designed by a partnership between NASDA and NAL (both now part of JAXA), started in the 1980s. It was positioned for most of its lifetime as one of the main Japanese contributions to the International Space Station, the other being the Japanese Experiment Module. The project was eventually cancelled in 2003, by which point test flights of a sub-scale testbed had flown successfully. As of 2018, Japan is developing the Winged Reusable Sounding rocket (WIRES), which if successful, may be used as a recoverable first-stage or as a crewed sub-orbital spaceplane. After the German Sänger-Bredt RaBo and Silbervogel of the 1930s and 1940s, Eugen Sänger worked for time on various space plane projects, coming up with several designs for Messerschmitt-Bölkow-Blohm such as the MBB Raumtransporter-8. In the 1980s, West Germany funded design work on the MBB Sänger II with the Hypersonic Technology Program. Development continued on MBB/Deutsche Aerospace Sänger II/HORUS until the late 1980s when it was canceled. Germany went on to participate in the Ariane rocket, Columbus space station and Hermes spaceplane of ESA, Spacelab of ESA-NASA and Deutschland missions (non-U.S. funded Space Shuttle flights with Spacelab). The Sänger II had predicted cost savings of up to 30 percent over expendable rockets. The Daimler-Chrysler Aerospace RLV was a much later small reusable spaceplane prototype for ESA Future Launchers Preparatory Programme/FLTP program. Most recent project is SpaceLiner. AVATAR (Aerobic Vehicle for Hypersonic Aerospace Transportation; Sanskrit: अवतार) was a concept study for an unmanned single-stage reusable spaceplane capable of horizontal takeoff and landing, presented to India's Defence Research and Development Organisation. The mission concept was for low cost military and commercial satellite launches. No further studies or development have taken place since 2001. As of 2016[update], the Indian Space Research Organisation is developing a launch system named the Reusable Launch Vehicle (RLV). It is India's first step towards realizing a two-stage-to-orbit reusable launch system. A space plane serves as the second stage. The plane is expected to have air-breathing scramjet engines as well as rocket engines. Tests with miniature spaceplanes and a working scramjet have been conducted by ISRO in 2016. Shenlong (Chinese: 神龙; pinyin: shén lóng; literally: 'divine dragon') is a proposed Chinese robotic spaceplane that is similar to the American Boeing X-37. Only a few images have been released since late 2007. ^ Chang, Kenneth (20 October 2014). "25 Years Ago, NASA Envisioned Its Own 'Orient Express'". The New York Times. Retrieved 21 October 2014. ^ Hoffman, Carl (22 May 2007). "Betting on a Mission Beyond Earth's Orbit". Wired. No. 15.06. Retrieved 12 June 2015. ^ "Orbiter Thermal Protection System". NASA/Kennedy Space Center. 1989. Archived from the original on 9 September 2006. ^ Hacker & Grimwood 1977, pp. xvi–xvii, 145–148, 171–173. ^ David, Leonard (7 October 2011). "Secretive US X-37B Space Plane Could Evolve to Carry Astronauts". Space.com. Retrieved 5 August 2015. ^ "OREX". Space Transportation System Research and Development Center, JAXA. Archived from the original on 24 July 2011. Retrieved 15 May 2011. ^ "Hyflex". Astronautix.com. Archived from the original on 19 January 2011. Retrieved 15 May 2011. ^ "HYFLEX". Space Transportation System Research and Development Center, JAXA. Archived from the original on 25 November 2011. Retrieved 15 May 2011. ^ a b Hacker & Grimwood 1977, pp. xvi–xvii. ^ Please refer to Project Gemini#Spacecraft. ^ a b c Hacker & Grimwood 1977, pp. 145–148. ^ a b Hacker & Grimwood 1977, pp. 171–173. ^ a b c "X-30 National Aerospace Plane (NASP)". Federation of American Scientists. Archived from the original on 21 April 2010. Retrieved 30 April 2010. ^ "Black Horse". Astronautix.com. Archived from the original on 22 July 2008. ^ Zubrin, Robert M.; Clapp, Mitchell Burnside (June 1995). "Black Horse: One Stop to Orbit". Analog Science Fiction and Fact. Vol. 115 no. 7. ^ Leonard, David (7 October 2011). "Secretive US X-37B Space Plane Could Evolve to Carry Astronauts". Space.com. Retrieved 13 October 2011. ^ Pasztor, Andy (14 December 2010). 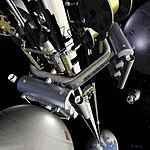 "Orbital Proposes Spaceplane for Astronauts". The Wall Street Journal. Retrieved 15 December 2010. ^ a b Morring, Jr, Frank (20 December 2010). "Orbital Aims For Station With Lifting Body". Aviation Week & Space Technology. Retrieved 20 December 2010. ...will use Virgin to market its services. But Sierra is also in discussions about using Virgin's WhiteKnightTwo carrier aircraft as a platform for drop trials of the Dream Chaser atmospheric test vehicle. ^ Foust, Jeff (16 December 2010). "Virgin joins forces with two companies on CCDev". NewSpace Journal. Retrieved 18 December 2010. ^ "NASA Seeks More Proposals On Commercial Crew Development". NASA. 25 October 2010. press release 10-277. ^ Gordon, Yefim; Gunston, Bill (2000). Soviet X-planes. Leicester: Midland Publishers. ISBN 1-85780-099-0. ^ "Russia Develops New Aircraft – Cosmoplane". Russia-InfoCentre. 27 February 2006. Retrieved 13 June 2015. ^ "Космоплан – самолет будущего". RusUsa.com. 3 November 2003. ^ Darling, David (2010). "MUSTARD (Multi-Unit Space Transport and Recovery Device)". Retrieved 29 September 2010. ^ "HOTOL History". Reaction Engines Limited. 2010. Archived from the original on 8 August 2010. Retrieved 29 September 2010. ^ "Skylon FAQ". Reaction Engines Limited. 2010. Archived from the original on 2 June 2015. Retrieved 29 September 2010. ^ "Bristol Spaceplanes Company Information". Bristol Spaceplanes. 2014. Retrieved 26 September 2014. ^ Bayer, Martin (August 1995). "Hermes: Learning from our mistakes". Space Policy. 11 (3): 171–180. doi:10.1016/0265-9646(95)00016-6. ^ McKee, Maggie (10 May 2004). "Europe's space shuttle passes early test". New Scientist. ^ "Launching the next generation of rockets". BBC News. 1 October 2004. ^ Dujarric, C. (March 1999). "Possible Future European Launchers, A Process of Convergence" (PDF). ESA Bulletin. European Space Agency (97): 11–19. ^ Hsu, Jeremy (15 October 2008). "Europe Aims For Re-entry Spacecraft". Space.com. ^ "FAST20XX (Future High-Altitude High-Speed Transport 20XX) / Space Engineering & Technology / Our Activities / ESA". Esa.int. 2 October 2012. Retrieved 29 December 2018. ^ "Saenger I". Astronautix.com. Retrieved 13 June 2015. ^ "Saenger II". Astronautix.com. Retrieved 26 September 2014. ^ "Germany and Piloted Space Missions". Space Policy Project. Federation of American Scientists. Archived from the original on 2 April 2015. Retrieved 26 September 2014. ^ "Indian Scientists unveils space plane Avatar in US". Gujarat Science City. 10 July 2001. Archived from the original on 22 December 2015. Retrieved 22 October 2014. ^ "India Eyes New Spaceplane Concept". Space Daily. 8 August 2001. Retrieved 22 October 2014. ^ "AVATAR- Hyper Plane to be built by INDIA". India's Military and Civilian Technological Advancements. 19 December 2011. ^ "India's Reusable Launch Vehicle-Technology Demonstrator (RLV-TD), Successfully Flight Tested". Indian Space Research Organisation. 23 May 2016. Retrieved 27 December 2016. ^ David, Leonard (9 November 2012). "China's Mystery Space Plane Project Stirs Up Questions". Space.com. Retrieved 13 June 2015. ^ Fisher, Jr, Richard (3 January 2008). "...And Races Into Space". International Assessment and Strategy Center. ^ Fisher, Jr, Richard (17 December 2007). "Shenlong Space Plane Advances China's Military Space Potential". International Assessment and Strategy Center. ^ Foust, Jeff (3 January 2008). "Invoking China to keep the shuttle alive". Space Politics. ^ "Douglas Astro". Astronautix.com. Retrieved 29 December 2018. ^ Christian Lardier; Stefan Barensky (2018). The Proton Launcher: History and Developments. John Wiley & Sons. p. 38. ISBN 978-1-78630-176-5. ^ "M-19 п▓.п°.п°я▐я│п╦я┴п╣п╡п╟". Testpilot.ru. Retrieved 29 December 2018. ^ Bart Hendrickx; Bert Vis (2007). Energiya-Buran: The Soviet Space Shuttle. Springer Science & Business Media. p. 450. ISBN 978-0-387-73984-7. Hacker, Barton C.; Grimwood, James M. (1977). On the Shoulders of Titans: A History of Project Gemini. Washington, D.C.: NASA. OCLC 3821896. NASA SP-4203. Kuczera, Heribert; Sacher, Peter W. (2011). Reusable Space Transportation Systems. Berlin: Springer. ISBN 978-3-540-89180-2.